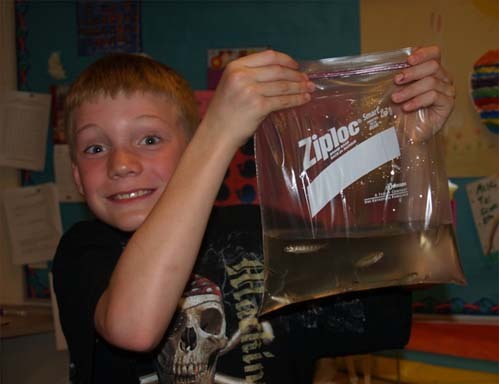 Above: Caden proudly holds up his batch of young salmon before boarding the school bus. Above: Onekama students show off their new aquarium unit, purchased with grant money from the Portage Lake Watershed Forever Council. 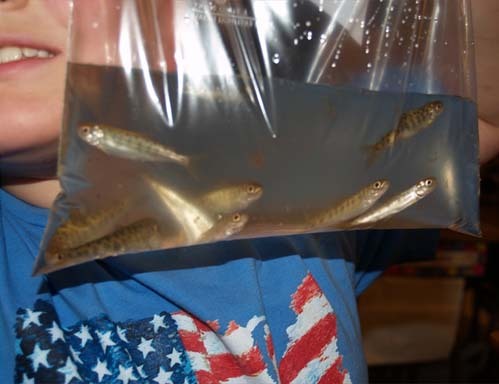 Since October, Onekama Elementary School third grade students have been patiently watching the steady growth of salmon in their classroom aquarium. They have fed the young fish, cleaned their tank, and charted their growth. 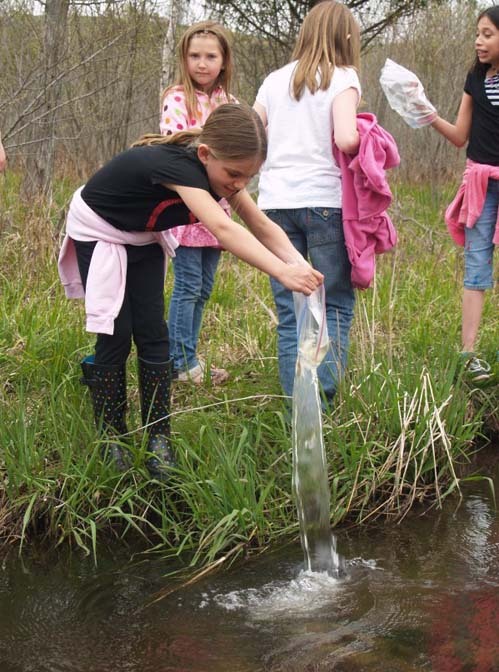 On Tuesday, May 10, like proud parents, the third grade class released their salmon into Bowen Creek in Arcadia. 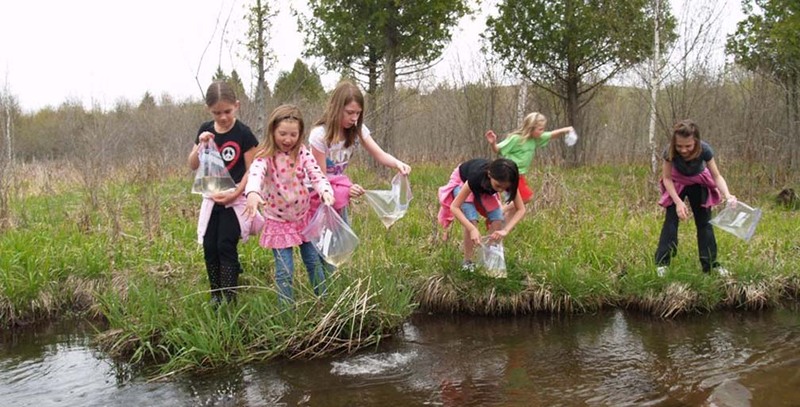 The salmon release was the culmination of the Salmon in the Classroom project, a comprehensive program developed by the Michigan Department of Natural Resources that teaches students about the state's freshwater resources through interactive, hands-on learning. 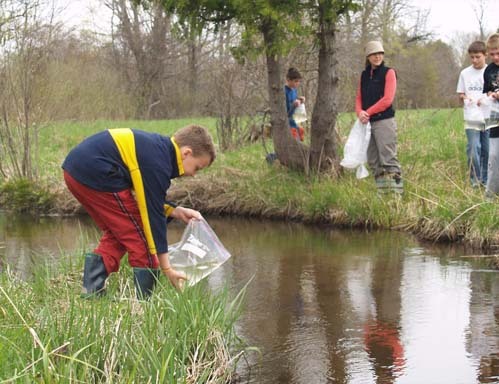 As part of their science curriculum, Onekama students have traveled to the weir to harvest the salmon eggs, raised the salmon from eggs, watched them grow, and then released the young fish into a local watershed that feeds one of the Great Lakes. During the course of the school year, the students have learned about the Great Lakes ecosystem, the lifecycle of salmon, and fisheries management. Onekama teacher Sally Catanese, who directs the Salmon in the Classroom project, has worked to help students understand the importance of environmental stewardship. 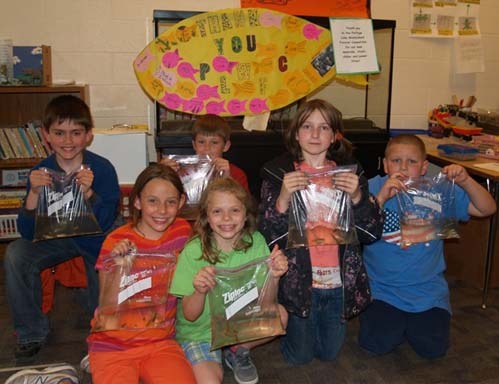 Through a generous grant from the Portage Lake Watershed Forever (PLWF) Council, the Salmon in the Classroom program will continue at Onekama Elementary School for many years ahead. PLWF provided funding for a new aquarium, stand, chiller, and power filter. We had salmon in our classroom fish tank. We raised those salmon for 8 months. It was fun to have them in our classroom. 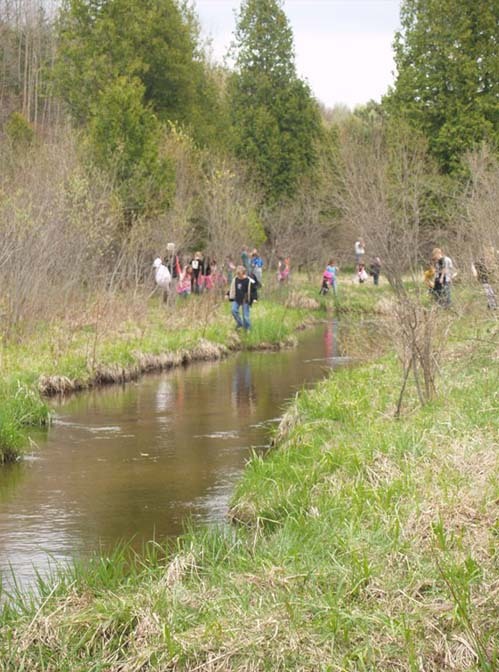 Now on May 10, 2011 we released them to a beautiful river in Bowen Creek in Arcadia. We had 289 fish in a little fish tank. Before we had 289 fish we started out with 400 eggs. Our fish project was amazing and fun. Last week we went to release the fish and it was fun. We saw a big fish. It was huge. We played Red Rover and Duck, Duck Goose. We played a lot. We poked fish with stick. We went to a creek in Arcadia. We had 300 fish. We released the fish so we would have more in the Great Lakes. Above: Emma says farewell to her fish friends. Oh my gosh, I forgot we released the salmon today. Isn�t that so cool? So I woke up , put my clothes on, brushed my teeth and combed my hair. I jumped in my car and went. When I got to school I filled up my water bottle. Then it was time to go. We went after lunch. We released the fish and played games. Then on the bus we noticed that Emma had a huge bump near her eye. She didn�t feel anything. It felt like a jelly fish even though I never felt one before. Then we got to the school and headed home. Above: Cody prepares to release his salmon. Above: Students watch their salmon swim in the wild after the release. It was October 14, I think when we got our salmon. I think we had about 400 eggs. Mrs. Catanese made us learn the life cycle of the salmon. The life cycle of a salmon is eggs, alevin, fry, fingerling, smolt, and adult. It was about January when the eggs hatched. About 1 month later they could eat real fish food. We kept them for about 7 months. On May 10th we let them go. After we let them go we tried to watch them as long as we could . We released the salmon in Bowen Creek in Arcadia. After we released them we got to play around a little bit. We released 289 fish and then went back to school. We were learning about salmon a long time ago. In October we kept the salmon for 8 months. Eight months later we put the salmon in watertight ziplock bags. There were only about 400 salmon eggs when we started and when released them there were 289. After that we saw some salmon swimming down to the stream. We also played a couple of games. Portage Lake Watershed Forever Award! Above: Students gleefully empty their containers into Bowen creek. 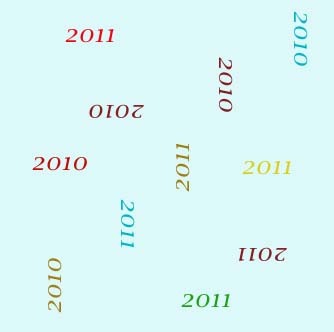 9th: At the Weir (2002-2003) Dec. 2002 Hatched!